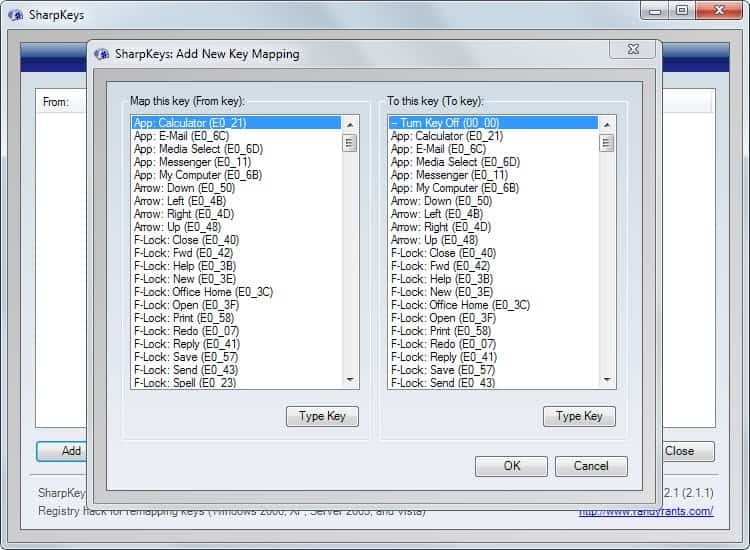 Sharp Keys is a free software program for Microsoft Windows devices that provides you with the means to remap keys on the keyboard. I never use some of the keys on my keyboard; the caps lock key for instance or media keys that are displayed on it. Since they are not helpful in any way and can also pose a problem if accidentally pressed I decided to map those keys to another function instead or plainly disable them. I was able to do that with the software Sharp Keys which lets you it possible to remap any key on your keyboard. The reason for using Sharp Keys instead of the Registry is simple. It's faster, it offers a better overview and can be undone faster as well. With Sharp Key I was able to map the ESC key to the Caps Lock key which means that ESC is pressed when I press the Caps Lock key or ESC. You can map other keys as well or disable them completely if you prefer that. Usage is pretty straightforward. Select a key that you want to map (From key) to another key from a list of possible keys (To key). In my case, it was From Caps Lock to Escape. You can also map applications, functions (mute volume) or folders like the My Computer folder to keys. To begin using the program, click on add in the main interface after launch. This opens the keys that you can remap. You can either go through the list of available keys or use the type key feature to find keys this way. If you do, type the key after you have clicked on the button. It will be discovered automatically by SharpKeys so that you do not have to go through the huge list of keys manually. All mapped keys are displayed in the main program interface afterwards so that you always have an overview of all keys that you have remapped. You do need to click on the write to Registry button after you have mapped keyboard keys to save the changes. Note that a reboot or log out and log in is required before they become available since the Registry is only loaded on user login. Keys can be removed by selecting them and clicking on delete, by using delete all to remove all custom key mappings, or by using edit to change the functionality manually. Update: SharpKeys has moved to a new destination. Development continued and the program should be compatible with all recent versions of Windows as well. SharpKeys is a useful software program for Windows users who want to remap certain keys on the connected computer keyboard. The program makes the operation dead easy, and provides options to restore the original mapping if the need arises.